In the early fifteenth century Galileo Galilei was declared a heretic. The religio-political leaders of the day declared him such for positing his theory of heliocentricity. 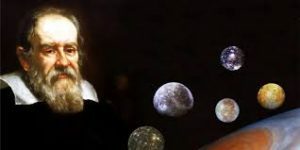 Galileo had discovered that our solar system revolves around the sun, rather than around the earth (geocentricity) as was thought. Let’s heed the lesson their arrogant presumptuous folly teaches. Things do not revolve around us! God created us for His pleasure and purpose. Right and wrong, good and evil, are determined according to His nature and decree. We are stewards of all that has been entrusted to us, and God will hold us accountable for all that has been placed in our care. He has delegated authority in the context of family, church and civil society (institutions initiated by Him) in order to facilitate wholesome self-government. Leaders in these spheres are therefore servants of God to people. Marriage is by design between one man and one woman for life. This is also the appropriate framework of the expression of our sexuality. Work is a noble pursuit, wealth an appropriate reward, and blessing from the hand of God. He abhors dishonest scales, for they undermine a righteous economy. Salvation is by grace alone, through faith alone, because of the Christ alone. A cursory glance at the above (and this is a most superficial and incomplete treatment of the subject) shows just how far the public debate has moved off solid Biblical ground, and just how non-PC (politically correct) the Scriptures are. What also continues to surprise is the degree to which I sound like a raging fundamentalist is this post, although I’m not. What I am is a grace man through and through, but please understand that the Good News of Last Adam has little consequence should first Adam not be fallen. So it is that I am firmly convinced that Jesus came to save us from our sins. And if we are judge and jury on right and wrong, then the Gospel has no need, for sin is without consequence at all. If that is so then let’s all do what is right in our own eyes, for our opinion on these matters is as close to absolute as any other person’s point of view. A parting thought. Those of us who are in Christ are not under law, but we are not opposed to law (antinomian) either. In fact, led by the Spirit, we are law-abiding individuals. Recognising the the depravity of humanity, we advocate for the rule of law wherever self-government shows signs of breaking down. We do so graciously and wisely, but firmly, for the health of the homes, churches and communities in which we live depends on it. 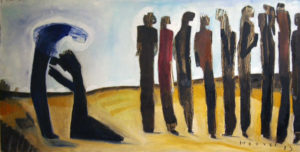 On His way to Jerusalem, somewhere between Samaria and Galilee, Jesus encountered ten lepers on the outskirts of a village. News of who Jesus was had reached these unfortunate souls, and so, staying at a distance as was their lot as outcasts, they cried out to Him for mercy. 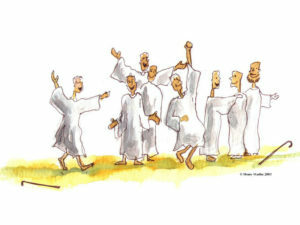 In response, He instructed them to go and show themselves to the priests. As they did so, all ten of them were healed. How kind is our God, loving indiscriminately, and curing the incurable. The incident is recorded in a way that uses words economically, yet it is richly nuanced for those with enough background to read between the lines. The only fellow who made the effort to thank Jesus was a Samaritan, and the way in which Luke phrases things strongly implies that the other nine were all Jews. Jews and Gentiles were reluctant bedfellows, but these men had found community in their leprosy. Therein is a parable, for all men regardless are united in their sinfulness, and sin is nothing other than leprosy of the soul. The ethnic divide in the group infers different priests and different temples – the Samaritan to Samaria; the Jews to Jerusalem. Does this not again speak to the modern church in penetrating ways. We, who were united in our lost-ness, are often divided in our found-ness, as church affiliations define us in polarising ways. This is so disturbing given that our very lives rest in a common salvation. A further noteworthy nuance is the way in which this incident blends into the broader story. Jesus was often rejected by Jews, yet received by the Samaritans and other Gentiles. Self-righteousness is indeed the enemy of faith, and Law is a ministry of death. It is so to those it disqualifies, and in another way it is also so to those who deceive themselves and permit their religiosity to craft and nurture pride within. Nothing quite carries the stench of death like fetid self-righteous arrogance, don’t you think? But Jesus healed them all! He healed the half-breed Samaritan who flung himself at the feet of Jesus in gratitude. He healed His Jewish brothers, whose testimony remained within the confines of the religious community in Jerusalem; the same community that campaigned vociferously for Jesus’ execution at the hands of the Romans. How ironic. Nevertheless, Jesus healed them all. Is this not an essential lesson for all who love to bless and minister to others? Love them all, no matter how leprous or self righteous they are. Love the grateful and the ingratiate equally. This is grace. I’m not suggesting that loving and expecting nothing in return is easy. The only way to travel down that path, albeit with stumbling steps, is with the help of the Spirit, and in the recognition of that being the way in which God loves us. Perhaps those who struggle the most with this are church and ministry leaders, for the success of our churches and ministries depends on others being willing to sacrifice alongside of us. For us, giving and giving without substantial return on investment spells vocational disaster, and so we – the professional lovers – are somewhat surprisingly the most likely to resent the “other nine”. When Jesus drew attention to these other nine (the account is in Luke 17:11-19), He was shaping our personal responses to grace. His philosophy of ministry remained unchanged – He healed them all. And so should we. But let’s you and I be like the one, responding to grace in faith and gratitude, and allowing these to move us. In doing so, we will be those who give praise to God in all things.